Remember this pattern piece? Well, I got enough time to work on my jacket last weekend to put it together. Anyway, first I sewed up that front dart. I pressed it open and applied the horsehair in which I had cut out the dart, catchstitching the seam allowance of the dart to the horsehair. The bit about the horsehair is not really relevant to what I'm trying to explain here but it is why the photograph is like this. 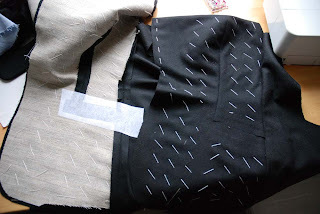 The dart gives such shape to the pattern piece that some bits of basting and catchstitching had to be done with the bust piece draped over my small tailor's ham. After that, I sewed the side seam and fused not-woven interfacing (Vlieseline, I never use that stuff except for things like this) to the spot where pocket will be. I prepared the pocket flap and welt pieces, and proceeded to make a bound pocket with flap as normal. 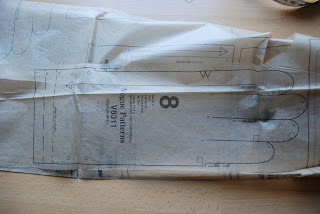 Only when I cut it open, I only had to cut though the interfacing for most of the pocket's length. And this was the result. I'm rather pleased with it. After the pockets, I made two bound buttonholes. Next up: padstitching the collar and lapels. And here's the proof. This is the center back piece with the horsehair back stay. I've cut the horsehair with half-width seam allowances and without the darts. 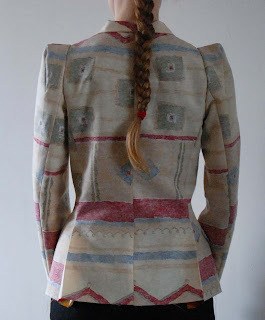 The shoulderdart (which I think can look quite cool moved to the center back seam like this) has been cut open at its wide bit, pressed flat and hand-stitched (I don't know the name of this stitch in English, in Dutch it is called flanelsteek). I wanted to get started last night, but I remembered that the only bit of horsehair in my stash was fusible. Yes, there is such a thing as fusible horsehair. I tried it out on a tiny scrap and it fuses really well and the end result gets quite stiff. Because I really want to try out the whole padstitching thing in this jacket, I didn't want to use it. So, I had to wait until today and go out and buy non-fusible horsehair. One question for the experienced tailors among you: Normally, I cut the undercollar on the biais to let it ease into the shape of the upper collar. And when using woven fusible interfacing, I match that. Now, I want to shape that undercollar with horsehair and padstitching, so what do I do? I know RTW jackets often have felt undercollars (which makes the whole grainline issue irrelevant anyway) but I have never taken one of those jackets apart so I don't know how those are shaped. Oh, and by the way, do you really have to use silk thread for padstitching? Unfortunately, I have a lot of other things to do today (it's my day off now, because I'll be working Saturday), like laundry, cleaning the house and some computer as well, so I don't think there will be any huge progress today. Last night, I cut the fabric for my jacket. A very nice black wool suiting. I will cut the horsehair interfacing tonight and hopefully make some small start on contruction. I plan to go for pad-stitching this time around. Shown in this picture is also the last real change I made (other than fixing the drag line in the sleeve). I attached the bottom side of the front piece, to the main bit of the front, leaving the dart only in the bit above the pocket. 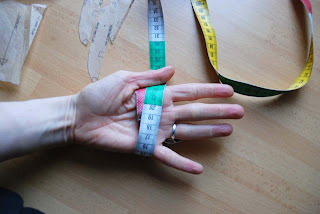 This is a nifty little trick which you will often encounter in RTW and also in some commercial sewing patterns. For quite a while, I didn't know how it was done and this is the first of my jackets to have this feature. The point is, there is not enough room for a seam allowance on the horizontal seams. However, that's OK because a bound pocket will be inserted at that spot. So: a pocket which would require cutting into the fabric anyway. 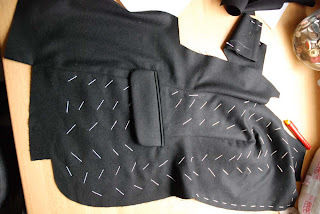 If anyone is interested, I will try to remember to take pictures when I start sewing those darts and pockets. 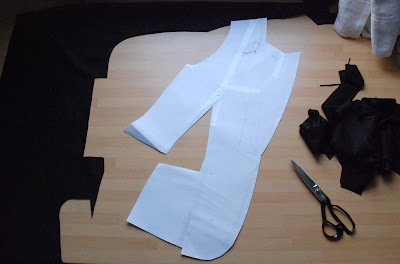 For now, I don't have a lot of time and I will have to look up some extra information on hand-tailoring (mostly to make up my mind about which is the best way of doing it...) but I am quite eager to get started. Finally back to real sewing, after so many muslins. 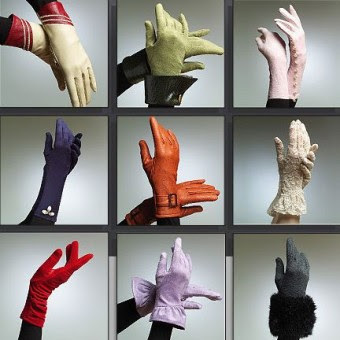 - Darci, I am also carefully considering the option of making an 'ultimate' pair of gloves by hand. In thin leather. Even though I know hand sewing leather is a PIA. And I think you might be OK using thin leather or suede for a pattern written for faux stretch suede. Real leather has a slight stretch of its own, it's only the fake versions which either do or don't stretch. - Marina, it's sort of a mini-sew along. It's me, Carolyn, Darci and some ladies following Carolyn's blog. Posting about it isn't very organised but it would be great to have you sew along with us. - Our Heroine, thank you for the link, I haven't looked yet but I will before I proceed with those gloves. - gwen, my top-tip so far: if you have Carolyn's pattern as well, the fit on that might be better. If not, stay tuned. I had a little time left over last evening and decided to get started on a glove muslin. I will use some jersey scraps and don't intend to make a wearable muslin. In fact, I may just make only one glove at this stage. 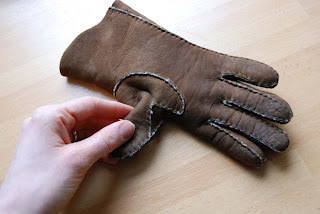 For the 'finished' gloves from this pattern, I have to options: stretch lace or re-used suede or leather. For the lace, view H, with the ruffle, seems to be the most appropriate, for the leather I would make the longest version of the pattern without decoration. 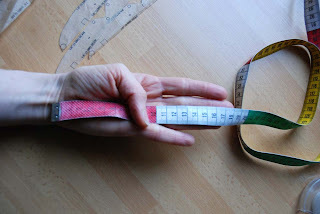 Like her, I measured whatever seemed to make sense and found both measurements to be the same and put me a size S.
able of lengthening or shortening a pattern piece myself. And I distinctly remember from the times I've bought gloves that different sizes always ment difference in width of the glove. This little thing made me rather less confident about this pattern but I decided to go on and cut out the pattern pieces anyway. It's been a very long time since I've used an envelope-pattern and I had forgotten all about how annoying pattern tissue is to work with. I was also surprised to see that Vogue had felt the need to print the pattern no less than five times for eight versions which are hardly any different from each other. I admit there are one and two sideseam versions, but any pattern magazine would have settled for the 'cut here for view X' option. Which would have made the envelope a lot thinner. Among that and the sizing, it looks like the good folks at Vogue are trying very hard to make this pattern look more professional than it really is. 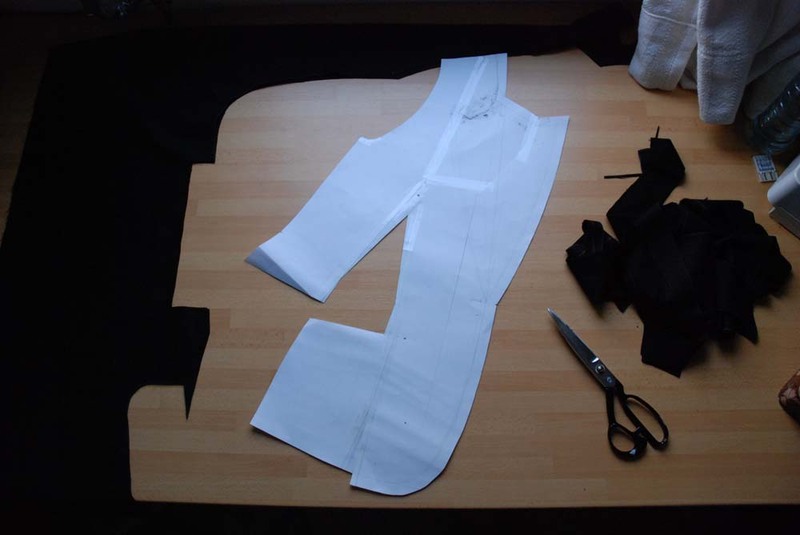 These are all the pattern pieces laid out for cutting (and how do you like my little work-table tableau?). It is view H with the ruffle and I will try one glove first. 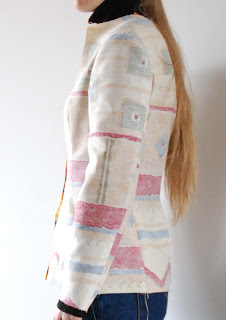 When sewing something like this, it pays of to know your sewing machine and to try out different stitches. The pattern recommends stretch stitch or zigzag for stretch lace and doesn't specify anything in particular for jersey. 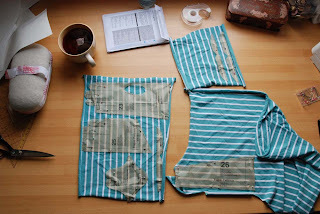 However, most sewing machines are not that great at sewing jersey on a tiny seam allowance, certainly not using a stitch which takes a bit of width in and of itself. I knew that on my sewing machine, a short straight stitch will work for most not-too-stretchy jersey fabrics. That is what I'm using here. I stitched the seam on the thumb-piece and then inserted it into the hand-piece. I followed the instructions and did the very thing Carolyn described in detail yesterday (although I made less effort to be precise about it. I didn't draw lines to stitch on or baste...). I'm not sure how to proceed. It looks quite a bit too big. I'm a bit surprised at how much too big it is. Carolyn's thumb looked fine and I have, based on the pictures on her blog, always thought of her as a slender lady of normal height (that's without reading. she did mention to be tall). Also when I buy gloves, I have size 6.5 to 7 or M. I guess this is just a circumspect way of saying I didn't expect to be this far off. I'm going to finish this muslin glove according to the instructions and then, I'll try and see where to go from there. There is one little thing I'd like to adress. Carolyn mentioned the excess material where the thumb meets the hand. I took a look at the gloves I own and found different solutions at that spot. 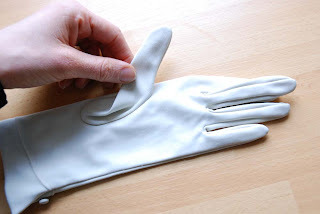 All my leather gloves have a shaped thumb piece like this. I think it would be nearly impossible to sew the likes of it on a normal sewing machine, but it does the job very well. It provides the thumb with a full range of movement without adding bulk. 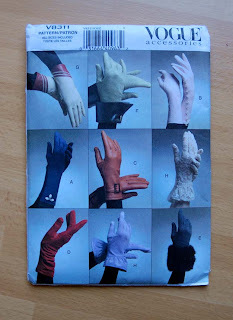 I also have these vintage stretch fabric gloves. These are cut very narrow, relying on the stretch of the material to fit one's hands (and these are sized. they are size 6.5). On these, the thumb piece is set into a eliptical hole like it is on the Vogue patterns but it is much smaller. This is not a post about fitting shoulders. I've been telling myself to write that one for months now because it's such an under-exposed issue in the general debate about fitting. But it will have to wait a bit longer. I'd like to thank everyone who commented on yesterday's post (and if you didn't but have an opinion to share, please add the comment there anyway. I always read new comments to old posts, and I'm definately still interested). My boyfriend had a look at the muslin as well and he decided he liked those sleeves on me. 'Crazy, but you' was his comment. Or at least, something along those lines. Usually, I can trust his opinion. I also had another look at those A/W 09/10 Balmain shoulders I mentioned yesterday. This is what those looked like. Although in construction they are likely to be quite similar to my sleeve, the effect is rather different. Where I have narrowed the shoulder where the sleeve band is wider, these seem to built up and out from the 'usual' armscye. Their effect is purely power-woman, mine is (if I may say so) an odd blend between that and vaguely neo-victorian. With that remark, I wanted to add a picture of a historical leg-o-mutton sleeve, but I won't because most of those were also 'built out' over the side of the shoulder to a serious extent. I have to say I'm less worried now about having my jacket look too much like last year's runway fashion. I will still do some fine-tuning, but I'm definately leaning towards going with the crazy sleeve. PS. In other news: It seems that Carolyn couldn't curb her enthousiasm ;-) and made a muslin-version of her gloves already... I'm looking forward to seeing her pictures of it tomorrow. If I'm no longer up for the finer points of pattern manipulation tonight, I may just try and catch up with her. And, as promissed, I will take pictures as I go along and tell you about it. Darci, it's great you want to join in, I really hope you're not feeling put off by this chaotic start. Well... What to say about this one? I would really like your opinion this time. I think the jacket body is about right by now. But, this is a muslin with the styling in place. And that's where I need your opinion: completely mental or kind of cool? There is some strange pulling of the sleeve at the front. I know why and I will fix it, so please ignore that. I'm not so sure what to think about this look. Before, I liked the banded sleeve, but I felt it could be pushed a bit further. So I did. This result does look a bit like those Balmain sleeves from winter 2009, which makes me wonder whether it looks too much like some fashionable one-day fly. I also went with a peaked lapel because it's the sharper look, which I thought would go better with the crazy shoulder than it's tamer cousin. 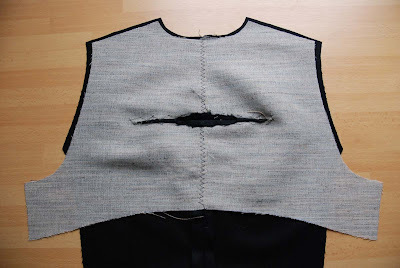 I did take out a little dart on the fold line before drafting the collar and that seems to have worked. And I added back vents. 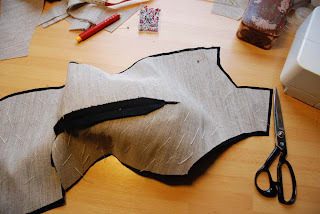 The pocket flaps are just pinned-on bits of fabric now but I plan to make bound pockets with flaps, using the usual jacket trick of cutting the bit below the pocket on the center front (hard to explain that properly, I'll record the process for you later). 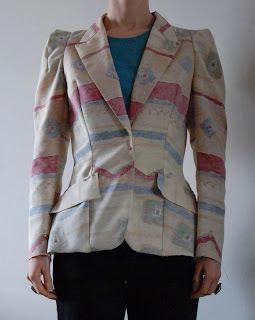 I didn't get much further on my jacket pattern this weekend, although I did transfer the changes, made in the last muslin, to the pattern and (I hope) fixed the back. 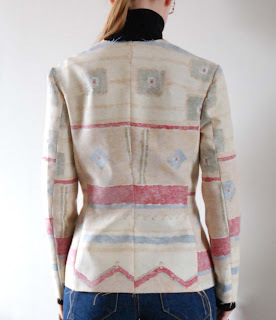 If my fix works, I may even try to do the same on the already completed jackets. So, there was not a lot of time left for sewing. There are more reasons why my personal sewing time is more limited than it used to be. 1. I'm now teaching. M and I teach a beginner's sewing class at a local highschool. And it's popular. We've got two classes of two full hours each. about 20 students of 12 to 18 years old. To keep them motivated, we allow our students to pick the pattern and fabric they want, as long as it's fairly easy. Which forces us to really stay on top of things because most students are doing different things. We also teach them how to make simple alterations and decorations to customize a given pattern. Some are learning quickly and all are enjoying themselves. And I'm starting to get sufficiently used to teaching to enjoy it as well. 2. I've got another assignment. 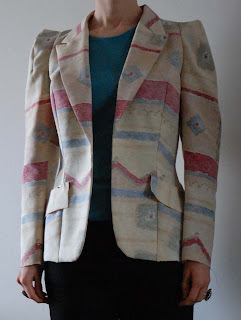 A friend asked me to make her a jacket. She's a lovely lady with a great figure but her shoulders are too wide for a RTW fit. And she noticed this. How could I say no? All this doesn't mean I give up on sewing for myself or resign myself to simple projects. Oh no. I just think those newly acquired will all have to hibernate (hmm, that's sleeping through the winter, any clue about how to make up a term meaning to sleep through the summer) in the stash for half a year. It will be the suit, and then on to spring/summer sewing. And, somewhere in the middle of whatever else I'll be working on, there will be this. 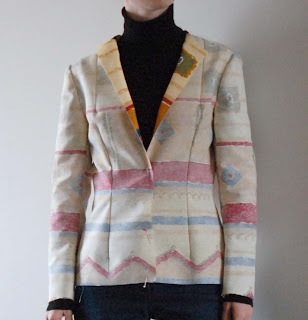 A few months ago Carolyn bought a similar pattern and wrote about it on her blog. I left a comment explaining how I had been given this one, V8311, over a year before and how I felt I needed some extra motivation to actually make it. I suggested a (mini) sew-along. By now, the wheather in her part of the world is cooling down enough to start considering gloves. And, of course, over here I could still do with some thin ones. So, there will be a sew-along of sorts. Carolyn's pattern is not exactly the same but I expect the basics to be similar. 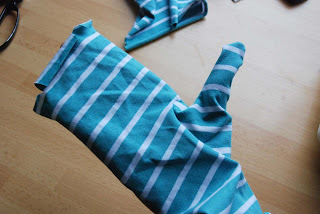 My pattern is for unlined gloves, to be sewn by machine from fabric with some stretch. I have never tried anything like this before and will document the progress step-by-step. Glove-making is a complete first for me as well, so I hope we can all learn as we go along. If you feel like joining, just say so in the comments! After all the posts about the jacket I want to make, I thought I'd try and put the garment in its rightful place in fashion history. My dictionary (the Oxford guide to the English language, to be precise) defines a 'jacket' as 'a short coat usually reaching to the hips; outer covering'. Going by that definition (which seems true enough anyway. Although, now that I think about it, it would, to me, also have made sense to make a distinction between jackets and coats in terms of thickness) jacket for men have been around since the late Middle Ages. And indeed, most fashion histories will describe it that way. The men's jacket we still know today has changed surprisingly little since the Victorian era. The jackets which became wardrobe staples back then, were, in themselves, merely much more sober versions of coats and jackets which had been around for much longer. I don't think it would come as a surprise to anyone that jackets entered the lady's wardrobe as practical pieces 'borrowed' from menswear. Mostly, these were for riding or travelling. Interestingly, women would have these items made by male tailors, who, after all, specialised in making this kind of item, while their dresses were made by female dressmakers. This distinction, although without its clear-cut gender separation, continues until this day in the workshops of traditional couture houses where the 'ateliers' are divided into 'flou' (=dressmaking) and 'tailleur' (=tailoring). 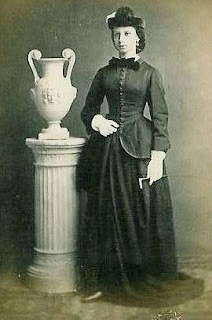 Victorian fashion sometimes flirted with elements borrowed from menswear and the separation of bodice and skirt in fashionable dress must have made this easier. Edwardian fashion pushed this a little further, with some ladies wearing actual dark suits with shirts and stock collars as day wear. However, the silhouet remained highly feminine until after the First World War. The roaring twenties brought a new kind of woman. A woman who wasn't afraid to show her legs, to smoke, to laugh in public and who was, in many countries, now getting more rights as in individual and a citizen. She didn't just wear flapper dresses. She would also wear suits, though still with skirts. Just look at the lady in the center of this picture. Doesn't that look a lot like a smoking? 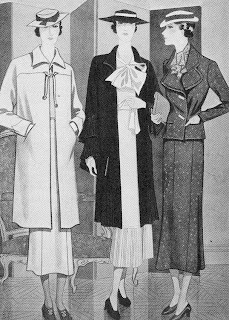 The 1930's with their return to a more traditional feminine silhouet, saw another kind of ladies' suit become a daywear staple. Just look at the lady on the right: it's a suit but it has a defined waist and a long sleek skirt. At the same time, this lady shocked many with this her look. 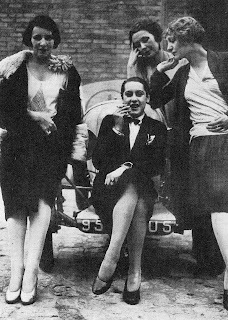 This is Marlene Dietrich. Of course, she's famous for wearing suits. This is a typical men's style, clearly tailored to fit her perfectly. The funny thing is, I knew the story better than the picture. When I was looking for pictures for this post, and came across this one, it surprised me how much woman this lady was. I guess (even though I'm not that interested in the whole celebrity-culture and I work with real women's sizes and shapes) I'm so used to the view of super-skinny celebrities that I subconsciously assumed that this movie-star in her suit would look more like the woman in the Helmut Newton picture. I really like Dietrich's suit. What I hope to make in the coming weeks should end up looking pretty much like it. I believe it's still a timeless piece, even after 80 years. I think this is a good point to end this post. I'll be back later with the jackets of the 1940's and onwards. I hope to make some progress on my jacket this weekend, but I'm not sure I'll have the time for it. I've had a nasty cold all week and I've been very busy with work. Thank you so much for your comments on the jacket progress so far! Sherry, you mentioned the overall balance... Yeah, I noticed that seemed a bit 'off'. And I'm trying to fix it. The book I started out with, however, wasn't Winifred Aldrich's. I'm mostly using that for details. The block came from my Dutch pattern making book, 'Grondvormen'. Which is great in that it's a very in-depth method and great for creating an understanding into how patterns work but less than great in that it was written in the mid-80's and can to have ease to match. It certainly did in the jacket block. For this next muslin, I've gone back to the block. If I am to take width out of the tops of the side seams, it will affect to armscye, so I thought I'd better sort that out without have any fancy sleeves in place. I also wasn't to happy about all kind of details of the collar and hem shaping. And, many most of all, I want the block to work. I want to be able to use it as a base for any future jackets. I've also switched to another muslin-making material. This was some cheap fabric which has a hand similar to real muslin. Probably better than the very soft flannel. I think improvement has been made. I want to see if I can sort out that dent in the upper back and I will lower the armscye by 0.5 cm because it feels just a bit snug. Other than that, it will be all about the styling. At least, that's what I was thinking, please correct me if I'm wrong. 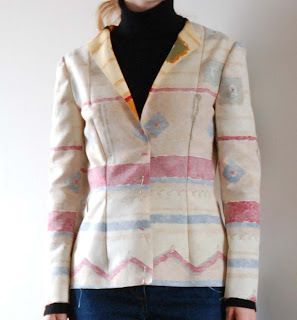 Oh, and one other question for the fellow pattern makers out there: if I try to make a deep neckline to my jacket, like I've pinned it in this picture, it seems like the upper front looses some of it's integrity. Which, in a way, makes sense because it's no longer held in place that much. And yet, there are many examples, both in patterns and in RTW, of such deep necklines. Is something which will sort itself out with the added shape of the collar? Or with the use of the appropriate stabilizers on both collar and jacket front? Or is there some kind of fix? Which is not in the books but gets passed on in the trade?